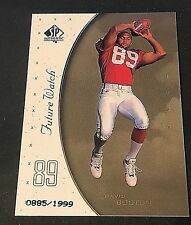 1999 Skybox Dominion Gen Next #2-20 GN David Boston WR Cards RC NM-MT Modern Original Non-Graded. It will be by weight of the actual item. No Exceptions! Nice card. Its not graded and I will not give an opinion on a potential grade. See pics for details. Returns will not be accepted unless item is damaged in shipping.